The first and the most important thing you should not do while working on the integration of mix match dining room chairs into the room is getting single units. There should be at least two pieces of identical chairs — this way, you will ensure that the atmosphere in the room is logical and solid, even if a bit diverse. Just one chair with a particulate design may often look out of place. While you will need at least a pair of each chair designs, it does not mean that the other pairs should be completely different. Quite on the contrary, make sure that each unit has something in common — for example, different upholsteries, but identical back colours. Also, you should keep your major decoration theme in mind. That is, if you go for a modern setting, stick to modern furniture designs. If you are working on a traditional interior, make sure each furniture unit has matching design, too. Even though it is important to stick to some easily traceable themes and designs, it does not mean that the arrangement has no room for contrast. After all, this is the major point of going with mix match dining room chairs — so feel free to experiment. Perhaps, the easiest way to create logical environment that is at the same time bold and contrasting is to get creative with your colour palette and try surprising shade combinations. Finally, remember that quality always comes first while shopping for new furniture. Whereas the price and the style are important too, material and build quality are the primary things that determine the life span of each piece. 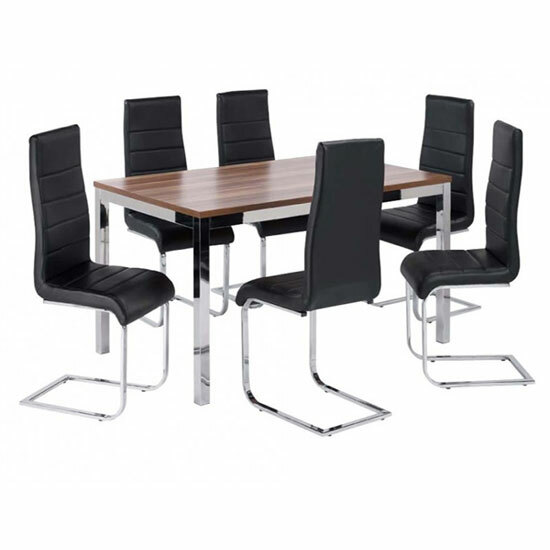 One of the best UK stores that can offer you a very interesting choice of products when it comes to mix match dining room chairs is Furniture in Fashion . This local platforms offers a very diverse selection of furniture from some of the most reputable manufactures in the UK and Europe. In addition, the store strives to keep its selection up to date, so if you are looking for the latest, trendiest decoration solutions, the selection will not disappoint you. And finally, as an exclusively local company, it ensures very quick delivery to every corner of the UK – even when you order bulky, complete dining room collections.